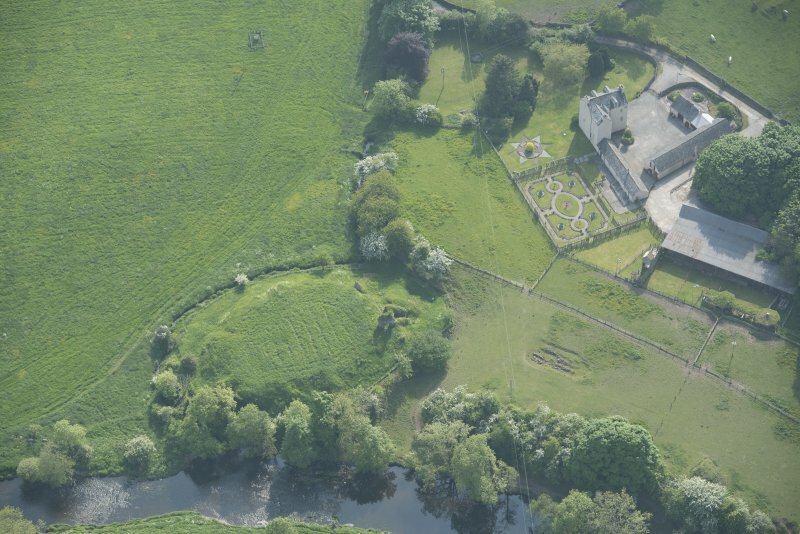 Oblique aerial view of Buittle Castle and Buittle Place Tower House, looking to the SSE. Oblique aerial view of Buittle Castle, looking to the S.
Oblique aerial view of Buittle Castle and Buittle Place Tower House, looking to the E.
Oblique aerial view of Buittle Castle, looking to the NNE. Oblique aerial view of Buittle Castle, looking to the SW.
Oblique aerial view of Buittle Castle, looking to the W.
Oblique aerial view of Buittle Castle, looking NE. 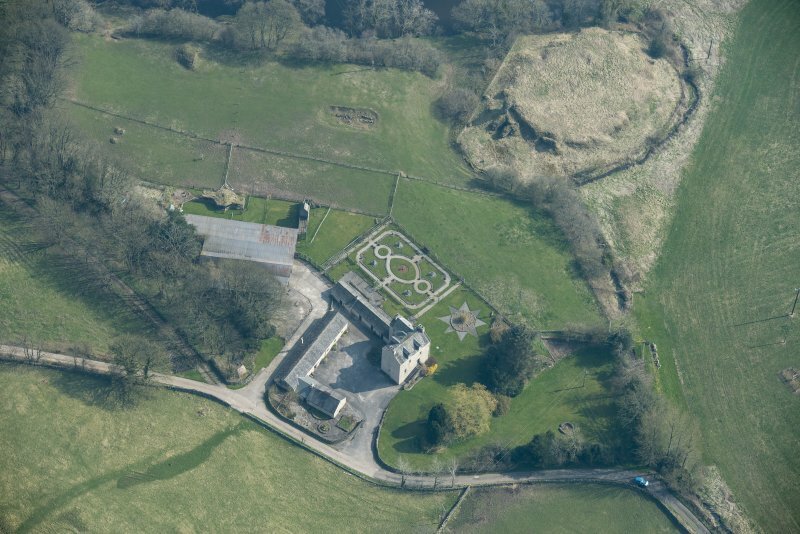 Oblique aerial view of Buittle Castle and Buittle Place Tower House, looking to the WSW. Oblique aerial view of Buittle Castle, looking SW.
Oblique aerial view of Buittle Place Tower House and Buittle Castle, looking E.
Oblique aerial view of Buittle Castle and Buittle Place Tower House, looking to the SE. See also NX86SW 1 and NX86SW 10. NX86SW 6.01 NX 818 616 Settlement: unenclosed (Romano-British). Buittle Castle, a courtyard castle dating to about 1230, built on a large 12th century motte and destroyed early in the 14th century, was excavated to some small extent last century. The castle belonged to Devorgilla and her husband John Balliol. On plan, the castle has been of the Edwardian type with curtain walls enclosing a space of c.150' by 100', and massive round towers projecting at the angles, indicated by a few fragments of walling on the SW slope. The main entrance was in the NW, where the existing masonry seems to indicate the central abutment for a drawbridge, measuring 14' by 8'6 with hewn walls 6' thick, each having a check 10" square hewn at the interior angles of the broken terminations to the NW. At each side of the abutment are the foundations of a round tower some 15' diameter within 6' thick walls, joined by a 4' wide passage. The outer slope of the deep ditch to the N and W has been banked up and converted into a roadway. To the NW is a plateau forming a bailey measuring 500' by 300'. Along the edge of the ravine on the N, and with a return for a short distance along the scarp overlooking the river, there are the remains of an artificial mound. NX 819 616, A finely built, ashlar-lined well was discovered during excavation. It is filled to within 5' of the top and appears to have been exposed by earth-falls only recently. NX 819 616 An investigation was carried out in advance of the erection of paddock fence posts in the bailey of Buittle Castle. It was known that the area in question had been occupied by WW2 concrete Walker buildings and a slurry pit which had been removed a few years ago. The area was at risk from damage from stock trampling and the digging of 33 post-holes up to 1m deep through any surviving archaeology. A series of 21 sondages were opened running N-S and a further 10 running E-W. Ten of the N-S sondages revealed evidence of a modern cut through the metalled surface of a medieval trackway/courtyard. This proved that all archaeology to the E of the cuts has been lost to agricultural action. All 10 of the E-W sondages confirmed that there had been no interference with the general archaeology of the site, that there was a great depth of good agricultural soil and the natural level appears to have been untampered with. The absence of any datable artefacts other than sherds of native galena-glaze medieval pottery, all of which could have been displaced during agricultural operations over several hundred years, make the site difficult to date accurately, although the metalled trackway/courtyard must pre-date the agricultural work on site which is known from records to date from the late 16th century at the latest. An eleventh season of excavation commenced on this site (DES 2001, 26) but, due to circumstances beyond the control of the excavation team, had to be terminated after only two weeks. An extension to the existing kitchen area was excavated resulting in the discovery of yet another cooking oven, the fifth to be found within this complex. 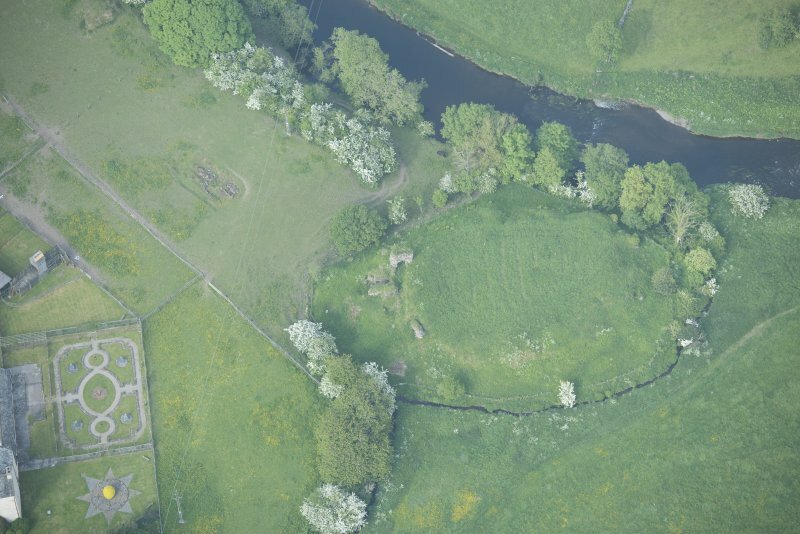 A 2m wide sondage was extended from the most southerly trench down into the moat surrounding Buittle Castle. The founds of a stone wall were excavated at the most southerly point of this feature and it was possible to discern, upon excavation, the somewhat gentle slope southwards down from the bailey to the edge of the castle motte. This excavation is one of the four finalists in the 2002 Pitt Rivers Awards. Sponsors: CBA, Dumfries and Galloway Council Community Fund, Dumfries and Galloway Tourist Board, Balliol College, Oxford. As described by Truckell and Williams. The well described by Williams is at NX 8192 6160. 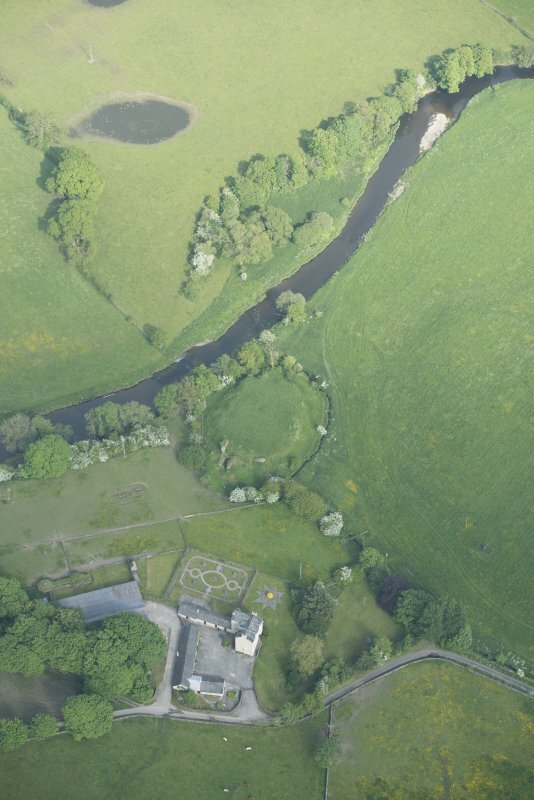 This site is situated in the valley of the River Urr in the grounds of Buittle Tower (NX86SW 10). 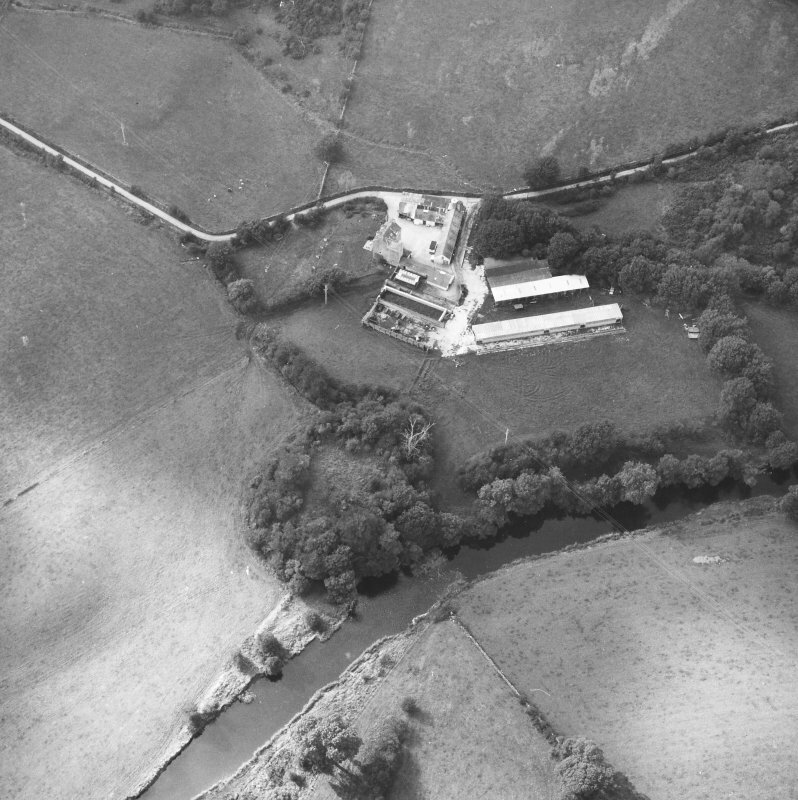 Formerly part of a farm complex, this site is being investigated at the instigation of the owner to determine the amount of damage done to the bailey courtyard and moat by agricultural operations. The castle was built by Alan of Galloway during the first quarter of the 13th century. One of the four Norman castles of Galloway, it was probably the natural successor to a timber-built tower surrounded by palisade fortifications which stood half a mile upstream from Buittle, on the site now known as Motte of Urr (NX86SW 1). Besieged by Edward Bruce from 1308-12, during the War of Independence it was the site of the royal courts of both King John Baliol (1292-6) and his son King Edward Baliol (1332-56). It was in the adjacent castle that Lady Devorgilla Baliol endowed Baliol College, Oxford, the grant being dated apud Botle, 1283. The castle was presented to the Good Sir James Douglas by King Robert the Bruce in 1324 subject to the yearly tribute of one pair of spurs. 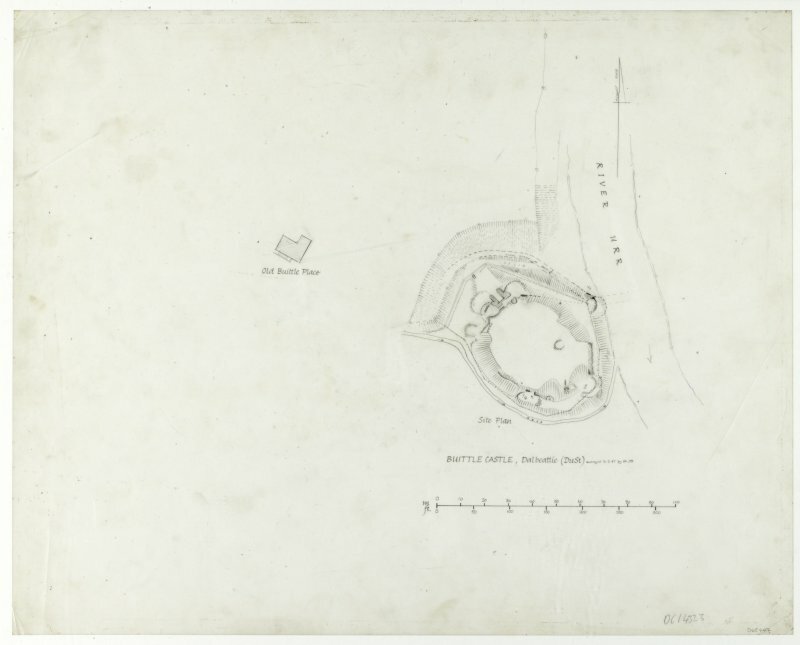 To date, three trenches have been dug, one 5m by 10m in size opposite the main entrance to the castle and two on the outer defence of the bailey, 3m by 5m and 2m by 5m respectively, directly above the waters of the River Urr. All have yielded evidence of extensive plough damage down to natural. A very battered penny of King Edward III ('busy with bushy hair', 3rd coinage, 1344-51) and an iron hunting arrowhead of the 12th/13th century were found in one trench and some sherds of yellow-green glaze pottery in the others above what would appear to be the remains of robbed wall footings. The pottery, by comparison with other examples found locally on motte and bailey sites, is dated to the 13th/14th centuries. Some small fragments of human bone have also been found which may relate to a period of siege at the complex. This is an ongoing excavation, and eventually it is hoped to examine a section of the moat prior to its being integrated into a landscaped garden, and also the riverbank for evidence of a harbour or landing-place, traces of which are visible. Two further trenches were excavated by volunteers in 1994, and all have yielded evidence of extensive plough damage down to natural. A testoon of Mary Queen of Scots (1578) and five iron arrowheads of the 13th/14th centuries were found in a trench opposite the main entrance of the castle and sherds of yellow-green, yellow-brown and yellow-green-olive glazed pottery have been found in all of the others. 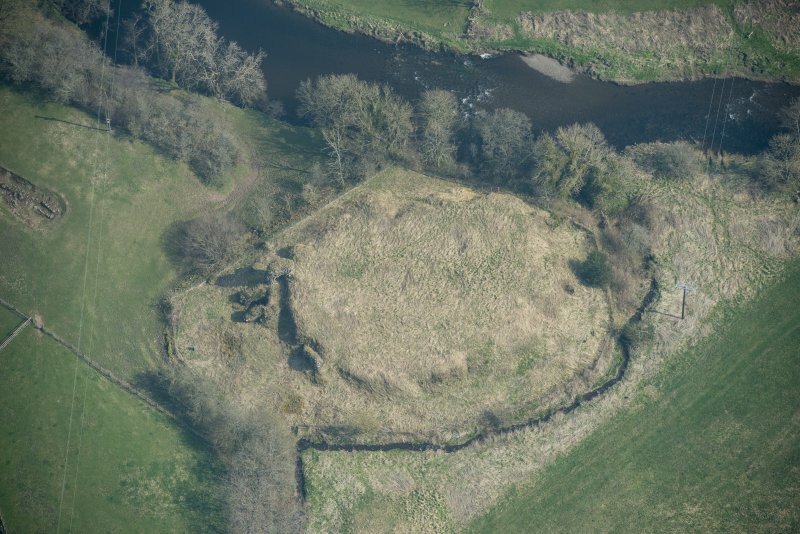 The pottery, by comparison with other examples found locally in Dumfries and Galloway, on medieval motte and bailey sites is dated to the 13th/14th centuries. Some small fragments of human bone and the lower jaw with twelve teeth of a male, aged 25-30, possibly related to the period when the complex was under siege. Fiddle-key nails and a variety of jewellery items have been found in three of the trenches. All of the artefacts recovered are in the care of the Stewartry Museum, Kirkcudbright. Building and industrial working evidence have been discovered in two of the trenches and evidence of a massive timber construction, in the form of two large post holes, possibly a watch-tower, has been uncovered in another. Three of the trenches have yielded flint evidence of an earlier prehistoric occupation of this site and include a Mesolithic microlith point, one broken Neolithic dagger and a knife and a variety of scrapers, blades and flakes. 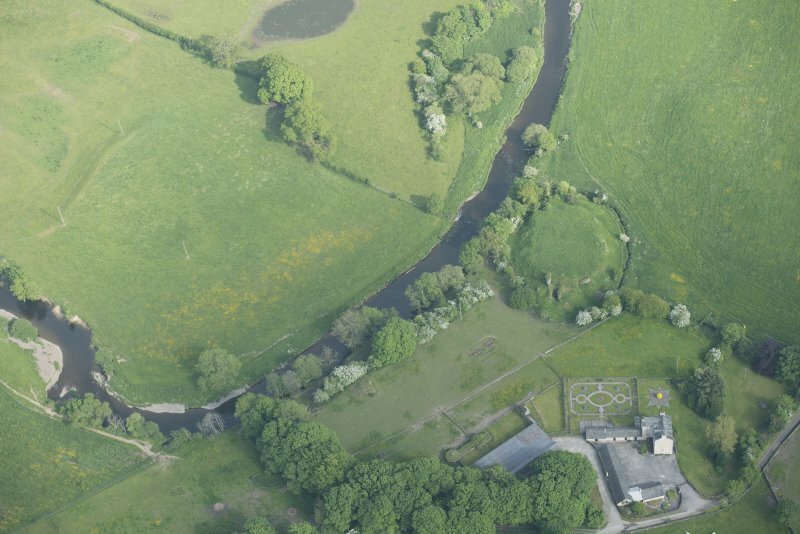 A possible harbour, with the capacity to hold several small craft, a watermill by the river, and a forfified cattle pound have all been identified adjacent to the excavation site. This is an ongoing excavation and eventually it is hoped to examine a section of the moat prior to its being integrated into a landscaped garden. NX 819 616. This ongoing excavation is now in its fifth season and staffed entirely by volunteers. Mesolithic occupation evidence has been found in one area of this site and in a trench only 50m away, there has been a proliferation of Neolithic, Bronze Age and Iron Age artefacts. Stake hole and post hole evidence, with accompanying lithic artefacts, within the confines of a network of soakways, testifies to the presence of at least two prehistoric buildings one of which would appear to be of round construction. Above this level is the mis-packed floor of a medieval building of the 14th century, in one corner of which was found the almost complete remains of a pottery candle-holder. Pottery and jewellery evidence also dates the occupation of this area to the 14th/15th centuries. A stone poincon or pottery stamp has been recovered. A third and later level has been erected over the 14th/15th century one with post hole evidence of 2m wide by 4m long timber building dug down through the earlier level. Another large timber building of the 13th/14th centuries, again dated by pottery and coin evidence, has been revealed outside of which there has been prolific copper and bronze working within the confines of a cobbled yard. A silver penny of King John (1199-1216), minted in Norwich after 1205, has also been recovered. As befitted Buittle's importance as a Scottish Royal site it is not surprising that a quantity of imported French pottery has also been recovered from this trench. In the most northerly trench on the site has been uncovered a cobbled floor of one building and the wall footings with a surviving section of clay floor of another, in addition to domestic fireplaces and furnaces. Another trench excavated to the N of the castle moat and W of the bank of the River Urr, has revealed evidence of massive military fortifications in the shape of two, square two-storey timber towers and a palisade which has been burnt down, probably having been set alight by fire-arrows, and which, from the charcoal and nail evidence, has then been toppled forward, downhill towards the moat. Mesolithic artefacts were recovered from this trench. The remains of a medieval roadway in front of the castle gates has been examined and, although extremely badly damaged in places by ploughing, can be dated from the recovery of a variety of arrowheads, pottery and coins, to the 14th century. NX 818 616 This ongoing excavation (Penman 1995), now in its sixth season and staffed entirely by volunteers, has uncovered much artefactual and some settlement evidence for the presence of early man in Galloway in the form of Mesolithic, Neolithic/Early Bronze Age, Iron Age and Roman occupation levels. Further evidence of the existence of the medieval Royal Burgh of Botel (1323/24) has been uncovered. The post-holes of both round and rectangular timber buildings have been excavated as well as additional building evidence in the form of stables set in behind the timber palisaded defences on the S and E defensive perimeters of the site. Evidence of bronze casting and associated metalworking was found. Artefacts recovered include a Papal Bulla of Pope Honorious IV (1285-87), bronze jewellery and clothing accessories. The remains of a building with stone foundations has been uncovered; above it was a later hearth and below it a Neolithic pasture level. From the immediate vicinity of this building, artefactual evidence in the form of bronze buckles, a seal matrix, a coin of Edward III dated to 1356-61, part of a wooden sword scabbard covered with a fine layer of copper, and items of domestic use, date this construction to the mid-14th-century era when (King) Edward Balliol (1332-56) was known to be in residence in Botel Castle after 1346. A large domestic hearth has been uncovered in one trench with a soakaway running along its length, and from this 131 large sherds of fire-blackened, yellow-green glazed pottery have been excavated. In the immediate vicinity of this hearth a pit and a sump have been found. An area of prehistoric pasture land has yielded a number of lithics, and there is post-hole and pottery evidence of an early roundhouse on this level. In advance of the construction of a riverside walk, excavations have started in the fosse to the N of the bailey and have yielded evidence of 13th-century construction of two stone walls and a massive buttress which could have formed the base for a drawbridge or gateway leading from the S bailey to a smaller N one which could have been an animal pend. This ongoing excavation (Penman 1996), now in its seventh season and staffed entirely by volunteers, and a runner-up in the 1996 Pitt Rivers awards, has uncovered evidence of a permanent settlement during the Mesolithic era, temporary settlement during the Neolithic/Early Bronze Age, and permanent Iron Age/Romano-British occupation from the time of Agricola's invasion of Galloway in AD 82-84. An assemblage of lithics has been excavated and a small Romano-British roundhouse has been uncovered, dated by pottery, two probe-type surgical instruments, a brooch and a faience melon bead. Some pre-medieval evidence has been found in the excavation of several pits thought to have been used in the processes of bleaching and tanning. 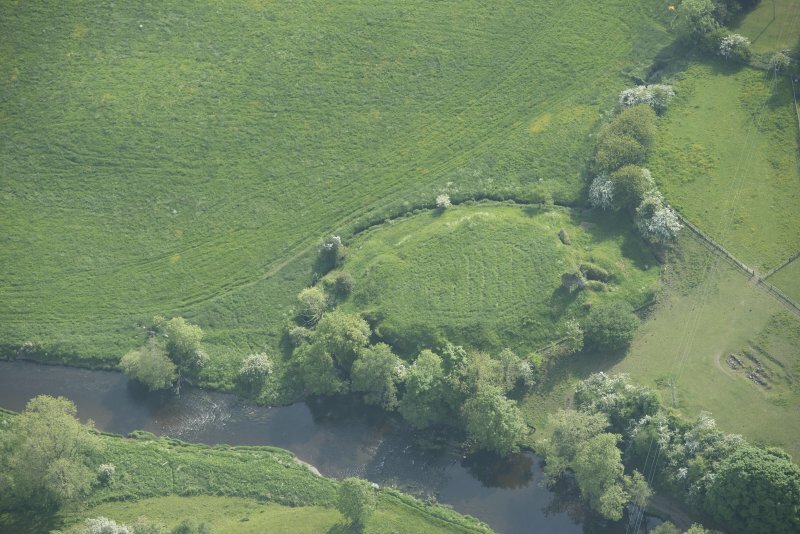 Further evidence for the existence of the medieval Royal Burgh of Botel (1323/24) has been uncovered in the shape of a timber double concentric roundhouse, a rectangular timber building and numerous stake-holes delineating burgage plots. The wall footings of a stone building are currently being excavated and the trench has yielded many artefacts including mint condition coins of King Edward III, a beehive thimble of the 13th/14th century, and the remains of a bronze-bound wooden box. Excavations on the defensive perimeter of the S bailey of the site have yielded evidence of a massive timber palisade to the S and E, and to the N a deep fosse was constructed by quarrying through the local greywacke bedrock to form a U-shaped ditch with a stone wall to the S and an abatis to the N. These were dismantled and tumbled into the fosse in antiquity, dated by pottery recovered from the rubble. Written evidence supports the dismantling of the castle in 1313 by King Robert Bruce. 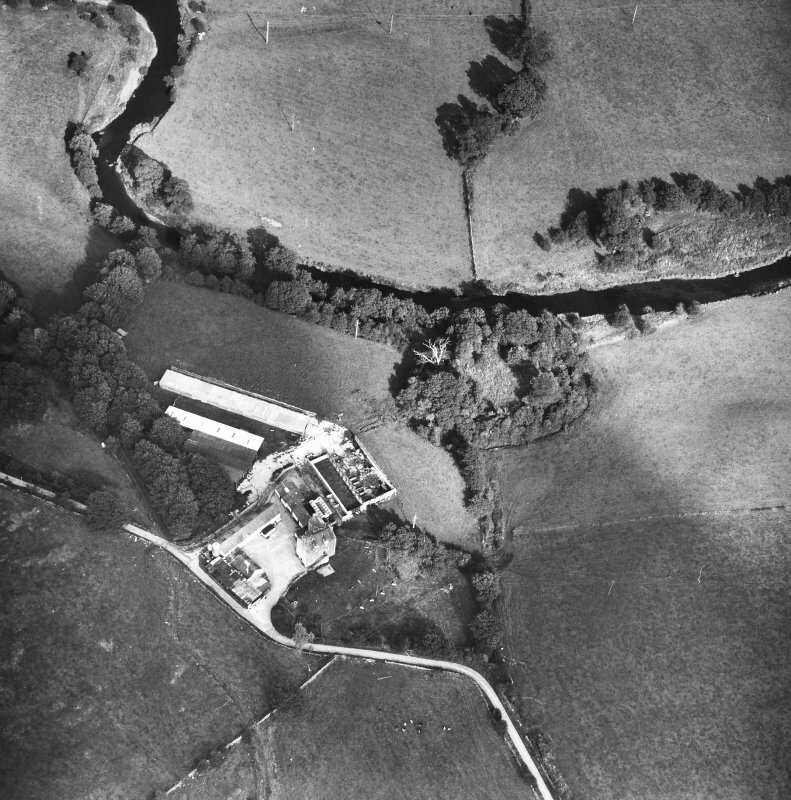 Several items from this excavation have been declared Treasure Trove (TT 45/94) and have been allocated to the Stewartry Museum, Kirkcudbright. A Penman and E Cochrane 1997. NX 818 616 This ongoing excavation (Penman and Cochrane 1997), staffed entirely by volunteers, has uncovered more evidence of medieval settlement in the bailey of Botel Castle (NMRS NX86SW 6) during the 13th and mid- to late 14th century. Evidence of the construction of a Mansion House by 'King' Edward Balliol on this site in c AD 1347 has been verified by the excavation of the founds of a large high-status medieval building. An L-shaped construction with stone founds and walls as thick as 1.3m in places, it has been postulated that it was constructed of stone walls up to 2m high then timber panelling up to roof level. A two-storey building, the roof was supported on massive posts. This would have been of timber or turf as no evidence of roofing stone has been found. There were timber doors with iron locks and at least some of the windows were glazed. Dating evidence is present in the form of coins of Edward III, a seal matrix (the second to be found in relation to this feature), imported pottery from N France, and a large amount of native pottery particularly distinguishable by its yellow-green glaze. An almost mint coin of Henry III and several shards of a very fine glass vessel were excavated from a backfilled drain or soakaway underlying the W wall of this building. In addition, a series of pre-medieval industrial pits and soakaways have been excavated on the site. One had been partly backfilled and a wall of the high-status medieval building built over it, with the upper part of the pit a later palimpsest. All of these pits contained sherds of later medieval pottery and one also yielded a bronze beehive thimble of the 12th-13th centuries. Several ovens and hearths associated with this building were found, one hearth yielding 236 sherds of native pottery, many conjoining. Evidence of either a later water supply or a drainage system has been found immediately adjacent to the platform of the N wall of this building - on the inside. On the defensive fosse on the N perimeter of the S bailey, the foot of a massive stepped buttress wall was exposed. Items from this excavation have been declared Treasure Trove and have been allocated to the Stewartry Museum, Kirkcudbright. NX 819 616 This ongoing excavation (Penman and Cochrane 1998) staffed by volunteers has continued to excavate the stone founds of a high-status medieval building in the S bailey of Buittle Castle. Further evidence for the construction of King Edward Balliol's mansion house, now definitely dated to AD 1347 from documentary sources, has come to light. Excavation has revealed evidence of two earlier buildings underneath. The large stones from a building of c 1250-70 have provided additional stability for the later building and beneath the 1250 building the post-holes of an even earlier construction have become apparent. The 1250-70 construction was destroyed by fire either wholly or in part, perhaps by King Robert Bruce who is known to have destroyed much of the site, here, including Buittle Castle, after its surrender to him on the 31 March 1313. The founds of several stone walls set into clay and cobble platforms have been excavated within the perimeter of the building, and from the presence of post-holes and large quantities of daub it may be postulated that this building comprised stone foundations surrounded by a timber framework which supported timber walls covered in daub. Two parallel walls running N-S and three walls running E-W have become apparent. The entire E wall of the building has been long eroded away and has collapsed into the River Urr. From the artefactual evidence it is now known that this building had timber doors with iron locks and small glazed windows, some with lead panes. The front door had a stone facade with a narrow, easily defended entrance and there is evidence of supports for a canopy-like construction leading up to the doorway. In the shelter of the W wall of this complex was a clearly defined roadway. Adjacent to the N wall of the building an oven, hearth and furnace base have been uncovered. To date the oven/hearth area has yielded 318 sherds of pottery, mostly of native production, but interspersed with some imported material from Northern France. A replica furnace has been constructed on site using the identical materials found in the excavated furnace base. Local hematite was obtained and several successful iron smeltings have been carried out during open weekends. An earlier ditch or drain was found underneath the floor of the high-status medieval building. It can be dated to the era of Roman occupation by a number of artefacts of that time which have been found in the bottom silt. This feature was backfilled with stone, then a layer of clay had been laid over this in medieval times, to allow the construction of a series of buildings on top of it. The walls of the building constructed on top of this ditch were clay-bonded, but even so they slumped into the earlier feature. There is evidence of an attempt at consolidation using large quantities of local river clay. The excavation produced a large assemblage of green- and yellow-green-glazed pottery of the 13th and 14th centuries, locally made, as well as some green-glazed and slipware examples from Northern France. Several shards of very fine Venetian glass have been excavated from a construction trench and can now be dated to c 1250-70. Several industrial pits were excavated underneath the floors of medieval buildings, and a date of c AD 1000 is suggested. They had been backfilled with a heavy black soil, some of it mud-pack, which can be dated by artefacts to 1100-1250. 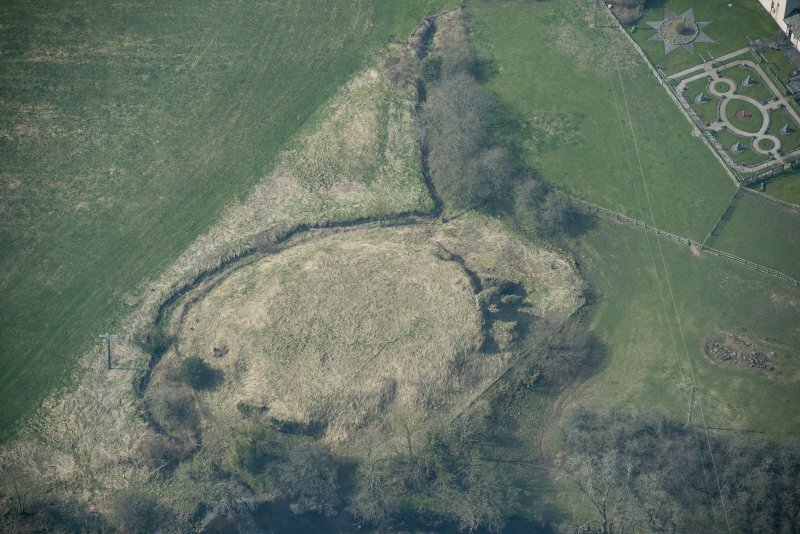 A defensive fosse, excavated on the NW perimeter of the S bailey, has produced additional evidence of the total destruction of the defences of the site in 1313 by Robert Bruce. 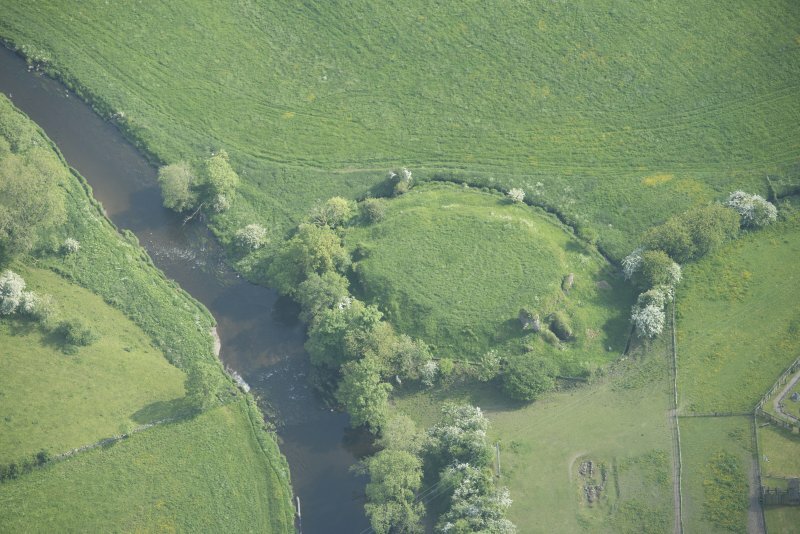 The fosse base, comprising a greywacke quarry, might have been one of the sources of building stone for the earliest stone castle on the motte, c 1180-90. A buttress in place in this trench is in the process of being excavated. Sponsors: Solway Heritage, Galloway Groundbase, Galloway Project, DGNH&AS. NX 819 616 At the completion of the ninth season of excavations on this site (DES 1999, 21-3), a plethora of walls of several high-status medieval buildings, industrial features of the 14th to 15th centuries, a Romano-Celtic pasture level and a backfilled proposed pre-medieval fish pond have been revealed. The stone foundation walls of several medieval buildings, some of them comprising huge greywacke and granite boulders, some set onto clay and cobble platforms, and all dating from c AD 1150 to c AD 1400, have been excavated in a series of five trenches. The earliest feature appears to be a building of the late 1100s which had timber foundations set into a clay-lined construction trench, timber walls and a turf or heather roof. This construction trench was later backfilled with clay and rubble, and a quantity of bronze slag and broken bronze artefacts along with fragments of furnaces have been found here. The trenches of this building were reused to support a later stone and timber construction which can be dated from the artefactual evidence to c AD 1250-70 - the heyday of the reign at Buittle Castle of Devorgilla de Galloway, Lady of Balliol. Artefacts from this level have included a mint coin of King Henry III, Venetian glass and pottery from Gaul, as well as a Papal Bulla of Pope Honorious IV (1285-87). Large amounts of native galena-glazed pottery have also been excavated here. The construction trenches and the bases of these early walls have yielded numerous prehistoric lithics and a small quantity of Roman and Romano-British pottery including sherds of amphora. A trench to the N of these buildings, 2m to the W of an excavated Romano-Celtic shrine, has produced more Romano-British pottery and a Roman bronze cavalry stud. Post-holes of later medieval buildings are also apparent in this trench. The foundation walls of a two-storey half-timbered building with clay-covered walls and small glazed windows, c AD 1350, have been uncovered and to the N overlie an oval feature which had been backfilled with medieval rubble and river clay. This may have been a pond for holding fish, probably salmon, caught in the adjacent River Urr. The presence of this once water-filled feature has caused a major collapse of the overlying wall. The remains of a rectangular clay floor into which was set a timber vat, presumably to hold fresh water, is becoming apparent just inside the front door area of this later building. Two of the trenches have yielded extensive evidence of furnace working and crucible making, and an oven built into the lee of the N wall of the c 1350 building has produced 498 sherds of medieval pottery, many of which are conjoining. Another oven was discovered 2m to the W.
A number of coins, including one of King Alexander III, have been recovered from the ruins of these buildings, as well as a bronze and gold brooch. Some Iron Age, Romano-British and a large quantity of medieval pottery has been recovered from the trenches this season. This ongoing excavation will continue next season when the trenches containing the stone foundations of the various buildings will be further extended. Sponsors: Stewartry Area Committee, Galloway Groundbase, Balliol College Oxford. A Penman and E Cochrane 2000. NX 819 616 At the end of the tenth season of excavations on this site (NMRS NX86SW 6; DES 2000, 19-20), a number of distinct medieval features relating to the 12th-14th centuries have been excavated. In spite of the stringent foot-and-mouth disease (FMD) regulations it has been possible to further excavate part of the southern bailey of Buittle Castle during the 2001 season. The remnants of the stone founds of an apsidal, N-S aligned building, dated to c AD 1250, have been revealed in the area immediately to the N of the castle moat. A small, two-roomed partitioned, clay-floored palimpsest building was constructed over an earlier feature, and has been putatively dated by the finding of a silver short cross penny of Henry III of c AD 1247 embedded in the clay of the floor. The evidence for earlier construction is identified by a deep, clay and charcoal backfilled, construction trench. A multitude of melted and part-melted bronze items were contained in the substance of the backfill. A clay sample taken from here, formed in the shape of the container which once held it, points to evidence of temperature-controlled environmental activities on site, from domestic ovens to metalworking. Under the N wall founds of a high-status medieval building, assumed to have been the residence of King Edward Balliol (reigned 1332-56), a series of four ovens were excavated, running E-W. They yielded numerous sherds of local galena-glazed native pottery, green-glaze pottery from Northern France (in the case of one, 499 sherds), and various items of decorated metalwork, including an ornately decorated bronze chape of a wooden sword scabbard. Further examination of this building uncovered parts of its clay flooring; in an extension to the main construction there had been three separate floors put in place as the building was altered and enlarged on two further occasions, presumably to cope with the increased activity on site during King Edward's sojourn. It has now been determined, from excavation of the clay floors, that this building was L-shaped. The W wall has been added to and consolidated over the proposed fish tank or cistern found previously, and the set back corner stone and a large square post-hole point to a problem of collapse having been encountered in the post-construction phase of the wall. An interesting array of artefacts includes a bronze key and a beehive thimble of the mid-14th century and part of a silver farthing of Edward I. In the SW quadrant of the main excavation trench evidence of industrial working has been painstakingly uncovered and recorded. This comprised considerable evidence of smithying, a shallow quenching pit which has been dated by pottery found in it to c AD 1250-1350, and to the N of these features were the burnt remnants of a timber wall or fence, many of the construction posts still in situ just above the natural level in the ground, their charred ends being easily identifiable. A further trench was opened to the S into the castle moat, but due to adverse weather it was not possible to carry out a detailed study of this feature which is currently yielding artefacts of the prehistoric era, including a flake of Arran pitchstone, and of Romano-Celtic and medieval origins. As the excavation trench containing the stone buttress in the Fosse was just inside the designated FMD area, it was not possible to carry out any excavation on this fascinating feature during 2001, but it is hoped to continue during 2002. Sponsors: Stewartry Area Committee, Galloway Groundbase, Balliol College, Oxford. A Penman and E J Penman 2001. 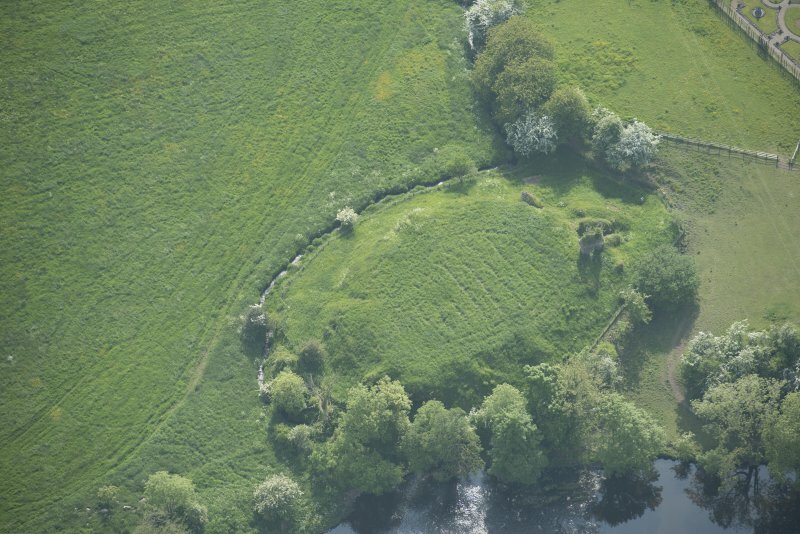 Scheduled as Buittle Castle... medieval in date and visible as earthworks and an upstanding ruin. Inforamation from Historic Scotland, scheduling document dated 11 November 2003. OS (GIS) MasterMap, August 2009. 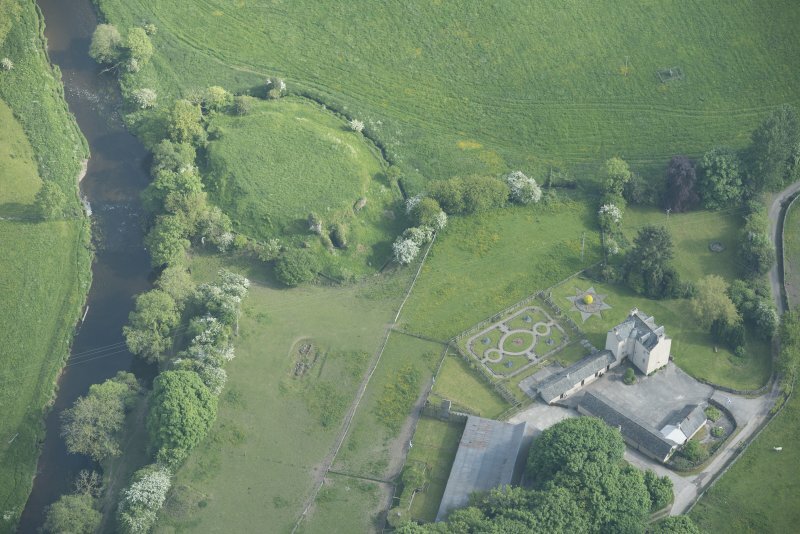 In 1992, in advance of landscape gardening in the grounds of Old Buittle Tower, a request was made to examine this medieval site which had previously been dated to c.1120 AD at the earliest. Two trial trenches were excavated, one in front of the gaeway of the ruins of Buittle Castle built on a motte adjoinig the bailey, and the other about half way along the eastern perimeter of the bailey directly overlooking the waters of the river Urr on what had, until only recently, been a market garden. On the medieval pottery and coin evidence uncovered it was decided to investigate this site for a season (1993). By the end of that season two trenches had been opened up and two more started, the details of which are contained in the Interim Report 1992-94. During 1994 completely new prehistoric evidence was found along the eastern edge of the bailey and it was decided to request an extensive period of excavation with the consent of the owner, Jeffrey Burn. the construction of the towers and no archaeological deposits were observed.